What are you doing year 1 million? National Geographic has a TV series with the title, Year Million! I guess we humans are not around 1 million years from now, but computers might walk on planet Earth. Already now the computers take over our daily life. I´m reading a futuristic book that takes place in outer space where super small nanorobots repair you from inside your body. “Hello. Would you like some delicious coffee?” the machine asks in Japanese. Yes, it is Japan´s newest barista talking to you. Travel agency H.I.S. Co. said Tuesday that a robot will serve coffee to customers at a cafe it plans to open next month at its flagship branch in central Tokyo. 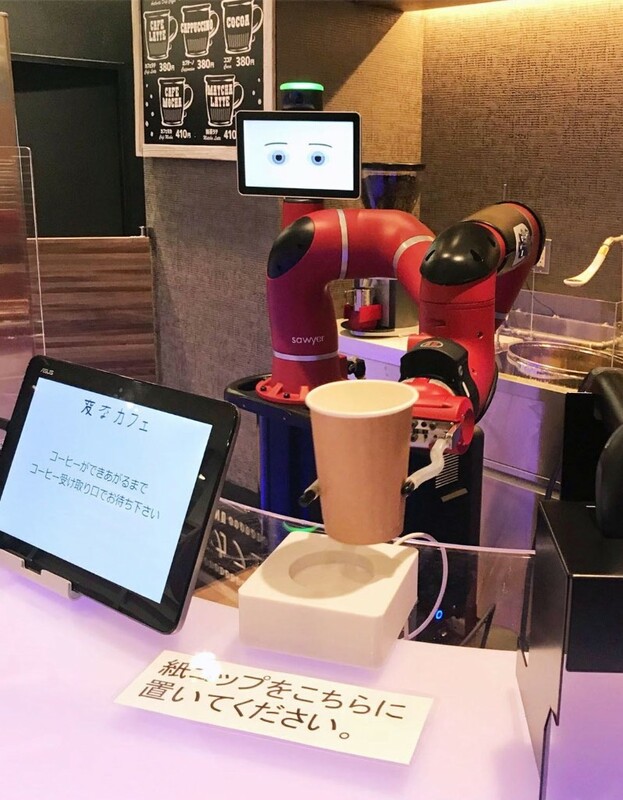 The agency’s new Henn Na Cafe (strange cafe) in Tokyo’s Shibuya Ward will feature a robotic arm and an automated coffee maker in the store. The move will add to the company’s series of services using robots, including at the Henn Na Hotel (strange hotel) in Sasebo, Nagasaki Prefecture, where a dinosaur robot welcomes guests at the front desk. At the Shibuya cafe, customers will be greeted by the U.S.-made robot, which has an attached screen showing facial expressions. To order a drink, customers first need to buy a ticket at a vending machine. The robot then scans a QR code on the ticket to process the order. The robotic barista grabs a paper cup and moves it toward the coffee machine before pressing a start button. The robot then places the finished drink on a reception counter. The ¥320 ($3) cups of coffee take three to four minutes to be served. The robot can also discard coffee beans and clean filters.